I did manage to finish hand-sewing the binding on to my Doll Quilt Swap 6 mini quilt while I was away! I'm head over heels in love with that little thing ... and my wife loves it even more than that! It is going to be tough to send it away, but I know it's headed to a good home. Pictures of that little quilt soon. Oh, and before I move on to the pics for this post, I wanted to answer some F.A.Q's (frequently asked questions) that keep popping up in my comments. I would usually answer each one individually, but SO MANY of you have your profiles set to "no-reply". I figured it was just easier to answer them publicly. Of all of the comments I receive, the questions I most frequently get asked are "how do you find the time? ", and "how can I get involved in some of these swaps?" The time question always amuses me because, as much as you readers tell me that I get a lot done, I always feel like I'm behind. I don't feel like my output level is nearly as high as y'all think it is, so it's nice to get such a positive reaction. To answer the time question, 99% of my sewing and quilting gets done between the time the kids are asleep (usually between 8 & 8:30 PM) and the time I go to bed (usually between 11 & 11:30 ... sometimes earlier, but often later), typically 4-5 evenings per week. I just try to be as productive as possible during those hours, sometimes working straight through on a single project, sometimes just trying to get a lot of stuff done for multiple projects. For example, I might spend a whole evening doing the cutting for multiple projects, or the ironing. I have, for the most part, forgone television (save a few choice shows), opting to catch up via my DVR on the nights I just don't feel like sewing. Right now, I have every episode of the current season of "Lost", my favorite show, but haven't been able to start watching it yet. As for the swaps question, many of you know that I am a devoted follower of Flickr. My first ever quilt block swap was on about.com (and it was great) and I've done some Craftster swaps since, but I quickly converted over to the Flickr swaps. A great place to start is to check out the ongoing swaps like the 6-12" Mini Quilt Swap, Swap 'Til You Drop, or the Mini Quilt in a Bag Swap. These swaps all welcome new members and regularly (e.g. monthly, in the case of the first two) start up new swaps. From there, it is easy to keep your eyes and ears open for other swaps, quilting bees, and the like being announced. 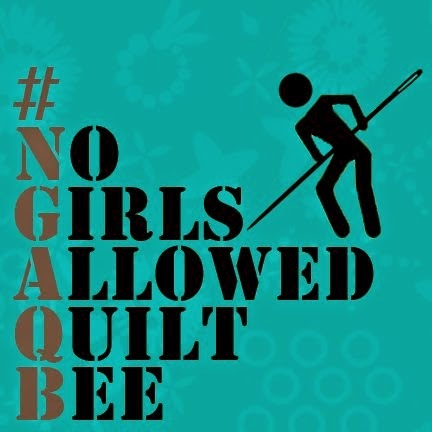 Several months ago, I proposed a "triptych" theme in the 6-12" Mini Quilt Swap. A triptych is defined as "art consisting of a painting or carving (especially an altarpiece) on three panels (usually hinged together)", and the idea was to create a set of mini quilts for your partner that all "fit" together. This could mean they follow a theme, or a color palette, or otherwise complement one another in any number of ways. I was partnered with Katy from the UK, who blogs at I'm a Ginger Monkey. I found a quilt block that I loved in Quilt Sampler magazine that featured Tula Pink's "Nest" fabric and decided to make 4 of them for Katy. Why 4? Because there were four distinct colorways in the Nest line, and I had the idea to make one for each of the four members of Katy's family. I had a charm pack and a layer cake, and I was ready to go! Katy and I were on the same wavelength, because she also made me quilts with my family in mind. Take a look at the amazing quilty portraits that she made of my three kids! Here are the backs of my new quilts. Katy has amazing taste in fabrics -- even the ones she uses for her quilt backs! These will be hung prominently in our home and will be treasured!! Thanks so much, Katy. I hope you like your little quilts as much as I like mine. Those are great...just recently started following your blog and enjoying all your quilts! love your minis! What a good use of the next fabrics!! the ones of your kids, how cool are those? What a great thing to be given! Wow - both groups are stunning! Hats off to both of you - GREAT job! Okies, I love the nesting mini's.. so the question is where can I find the fabric? Wow - you both did an amazing job with the swap quilts. Absolutely incredible! Love those portrait quilts! Wow. They are fantastic. Love the Nest set that you did - what a great idea. Great Quilts John! I've been following those flikr swaps for a while now, but haven't had the nerve to join. My schedule is so crazy that I wouldn't want to commit to something and then have to back out. My first online swap was on the about.com quilting forum too! I still participate there as often as I am able. I mostly do the noodle and fat quarter swaps. Mostly the unsewn item swaps. They are a great way to diversify your stash. Did you get that thank you card I sent for the pillows? I hope it made it through the mail. I was worried it might get stuck in a sorting machine because it was thick. After sending it to you I realized how close you guys live to my family. My brother and his wife are in Angier. He's a police officer in Fuquay Varina. I completely understand about the time issue with family. I try and get as much done after my kids go to bed. We normally keep my oldest son up till about 10 because he will get up at the crack of dawn if he goes to bed any earlier! The DVR has become great friend of ours as well! Katy does wonderful work. I have participated in a swap with her. It is very fun! I love these mini quilts. I'm new to all this, though, and have questions. 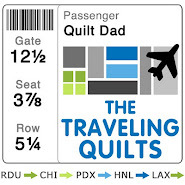 First, what size are mini-quilts? Second, what do you do with them (other than LOVE them of course)--I mean do you hang them and change them out? You quilt so much, do you have a huge pile of quilts or do you enjoy, enjoy, then send them off to good homes? I'd like to try a few mini quilts cuz they seem like a fun way to try out a new technique or pattern and not get too bogged down in a long project. Can you do a post where you explain what you do? Thanks so much--your awesome! i love the quilts that you sent and the ones that you received. they are all amazing!!! I love these! I missed out on the 'nest' line - I don't know where my head was at, they are gorgeous fabrics! Katy's work is amazing - as always. Those portrait quilts are just amazing!